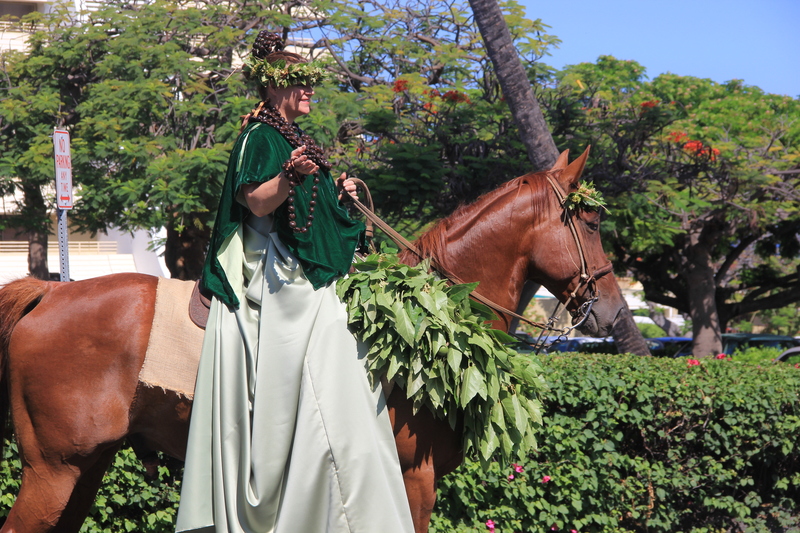 Horses were unknown to the Hawaiian people of old. That changed when Lelia Byrd – a merchant-vessel of American registry; William Shaler, master; arrived in Kawaihae Bay, Hawai’i, June 24, 1803. Richard J. Cleveland ships owner had procured a horse, two mares and foal in California to present as a gift to the King of the Sandwich Islands ( Hawai’i ). The purpose of the anchorage at Kawaihae was to land the mare and foal near this place. John Young, friend and adviser to King Kamehameha resided close by. After getting the animals ashore Cleveland wrote in his journal: “this is the first horse to ever trod the soil of Owhyhee” (Hawai’i). 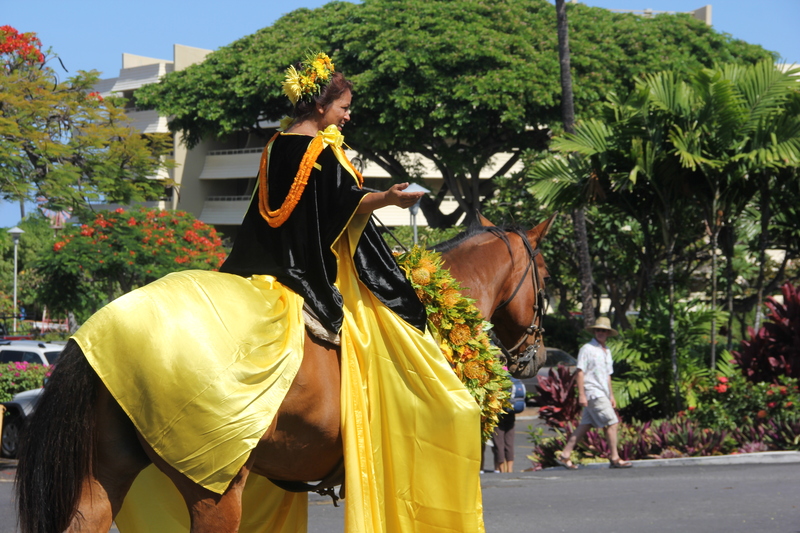 The Lelia Bird then proceeded on July 7, 1803 to Lahaina, Maui and safely landed the horse and mare, presenting them to the King. It is said Kamehameha was impassive and emotionless on his first seeing a horse, apparently not realizing the usefulness of the gift. 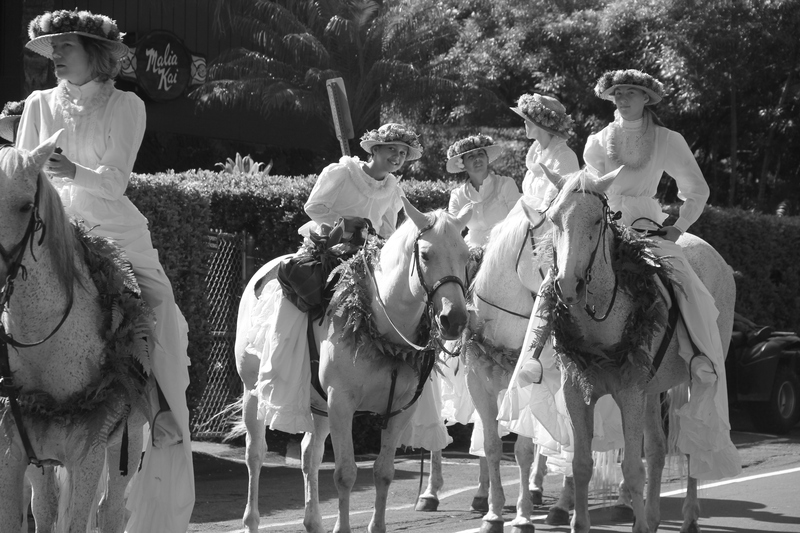 It wasn’t long before women in Hawai‘i became accomplished riders. 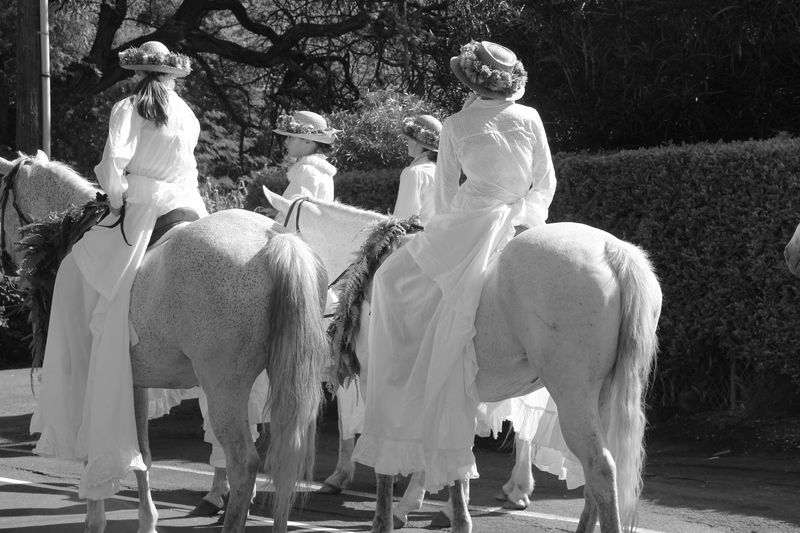 At a time when it was only considered proper for a woman to ride a horse via sidesaddle, or “aside”, the women of Hawaii rejected the imposition and instead simply hiked up their skirts. 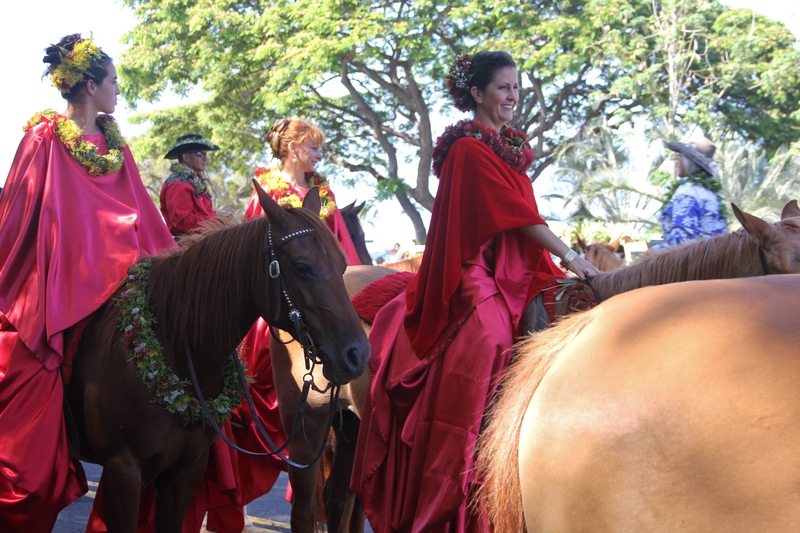 They chose to ride astride the horse in their pa’u (long skirts), which draped over the horses and flew like streamers as they rode by. 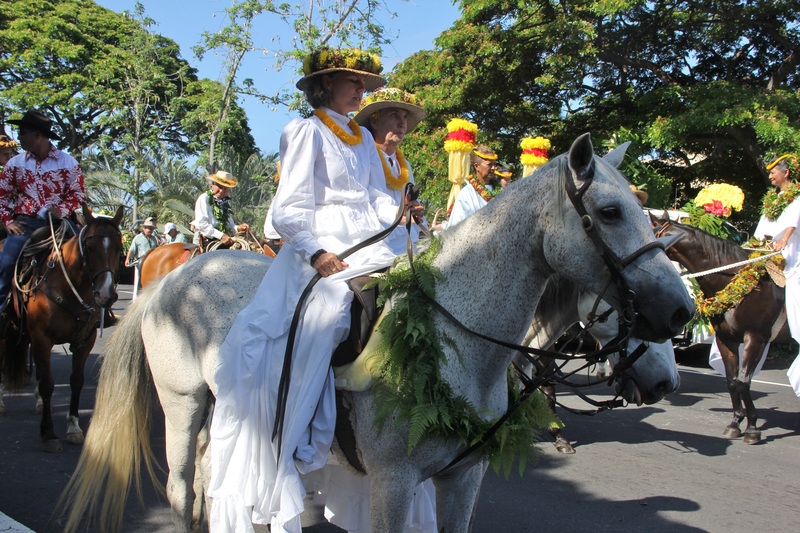 The history of Pa‘u Riders dates back to the mid 1800s following the arrival of the first horses in the Islands in 1803. 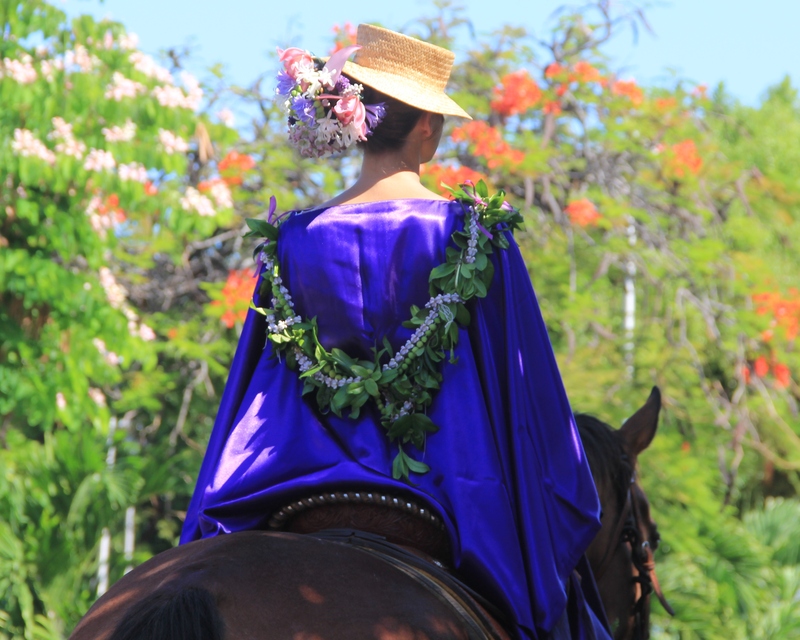 To ride astride her horse with modesty and formal dignity Hawaiian women, devised an outer cover skirt (pa’u) to protect their shoes and dress clothing while traveling over dusty and muddy trails on the way to social visits. Early pa‘u skirts were fashioned from available fabric, usually calico or gingham, and fastened at the waist and ankles with rope so that even the feet were covered. The pa’u is a type of culotte made of a single piece of fabric, usually nine or 12 yards in length. 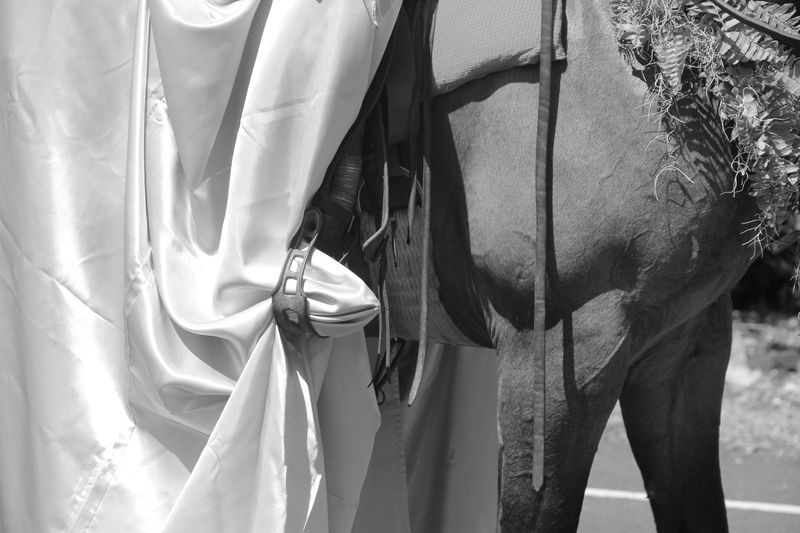 The cloth is not sewn but simply wrapped around the rider in such a way as to flow over the stirrups and to the ground like a royal cloak. The pa‘u is only held in place by 6 or 8 rough surfaced kukui nuts that are twisted inside the fabric. The fold of fabric and nuts are then tucked into a string around the waist and pulled downward for a secure fit. “To the old-timers of Honolulu time seemed to have gone backward in its flight when they saw this morning the long line of pa’u riders following the automobiles and other rigs in the Floral Parade. The pa’u section was a picturesque part of the parade, and it was a reminder of old times to hundreds of those who watched, for pa’u riding, which has been unseen here for many years, was once a regular performance.” (The Hawaiian Star, February 22, 1906)………..
“There was a most striking array of pa’u riders. … A new feature this year were the Island princesses. 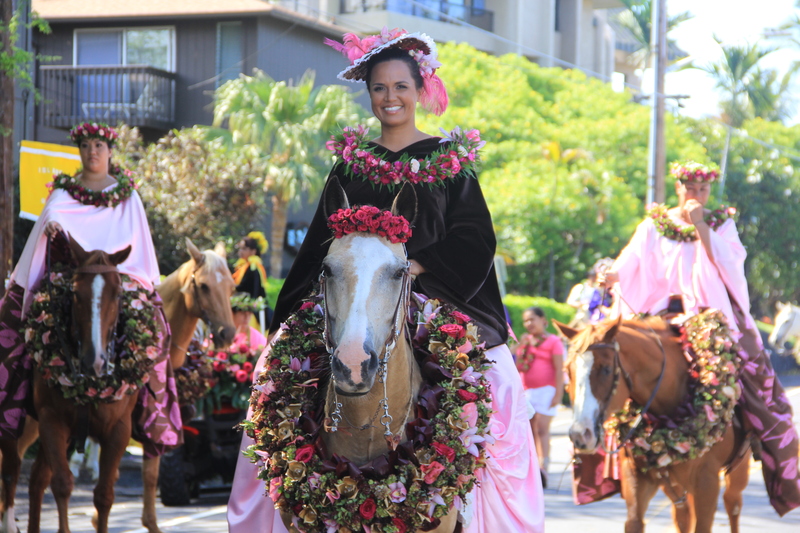 It was in this division that the most elegant horses were shown.“ (The Hawaiian Star, February 22, 1907)………..
“The pa’u riders were undoubtedly the most unique feature of the parade. The revival of the old picturesque riding costume is certainly an excellent idea. It has undoubtedly returned to stay, for it has now made it evident that after this no parade would be complete without it.” (Evening Bulletin, February 22, 1907)……….. 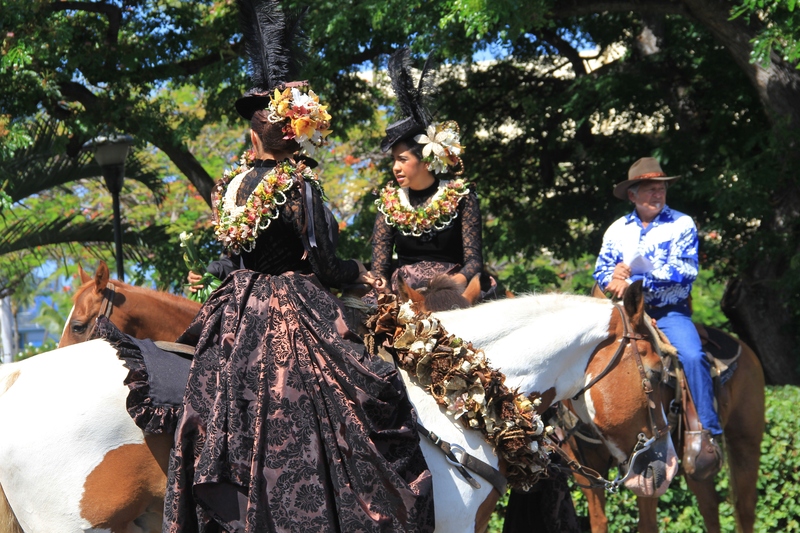 The arrival of floral parades in Honolulu in the early 1900s ushered in more elegant fabrics like satin, as well as more floral decoration and accessories for both horse and rider. 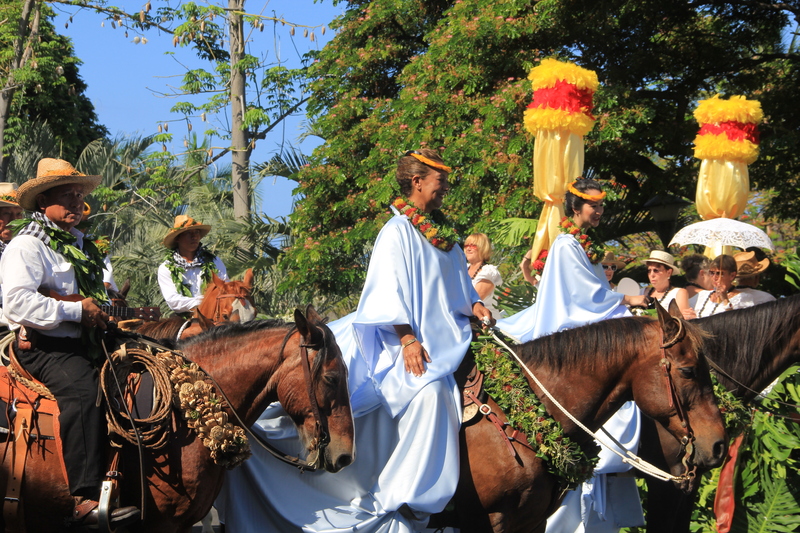 Through the years the floral parades become more elaborate, pa’u riding evolved into a ceremonial display in which lei bedecked women demonstrated their skilled and graceful horsemanship. 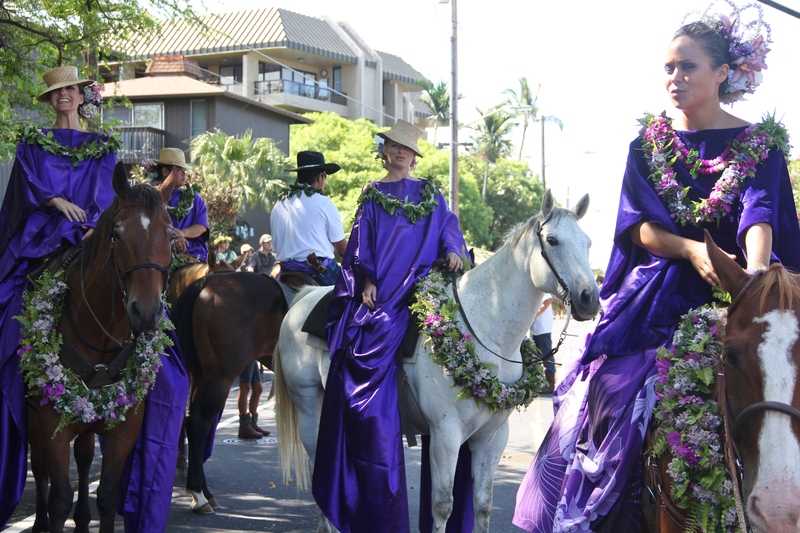 There are traditionally eight equestrian units at the Aloha or Kamehameha parades. One to represent each island of the old Hawaiian Kingdom. Every article of clothing, accessory, color and the flowers chosen all have significance and meaning. There is a story and history behind everything. Red for example represents the island of Hawaii, Kauai is purple, Molokai is green, Kahoolawe is the color grey, Lanai is orange, Niihau white, Maui pink and Oahu is the color yellow. Prior to any equestrian parade the horses must be shod, groomed and drilled in the appropriate maneuvers. Wardrobe must be selected, pressed and ready. For pa’u riders foraging trips are planned for field and native forest. Into the mountains gathering plants, collecting seeds, pods, vines and flowers connects the riders with the bounty and the beauty of the Earth. Then skilled hands are busy for an hour and a day, creating elaborate haku lei and a corsage for the hair. Being close to animals, breathing in the air, walking up a mountain, picking flowers, weaving them, the touch, the smell, the colors, all of this the pa’u riders bring with them. While visiting Hawaii in the year 1875, long before the parades, British adventurer and world traveler, Isabella Bird was enthralled by the local pa’u riders she encountered. In her book The Hawaiian Archipelago. Six Months Among The Palm Groves, Coral Reefs & Volcanoes Of The Sandwich Islands, Isabella Bird wrote of how impressed she was and the admiration for the Hawaiian culture’s love of horses, particularly that of the women. “Every now and then a flower-wreathed Hawaiian woman, in her full radiant garment, sprang on one of these animals astride, and dashed along the road at full gallop, sitting on her horse as square and easy as a hussar”……. “The women seemed perfectly at home in their gay, brass-bossed, high peaked saddles, flying along astride, barefooted, with their orange and scarlet riding dresses streaming on each side beyond their horses’ tails, a bright kaleidoscopic flash of bright eyes, white teeth, shining hair, garlands of flowers and many-coloured dresses”……..
Pa’u riders train for years to master their craft. 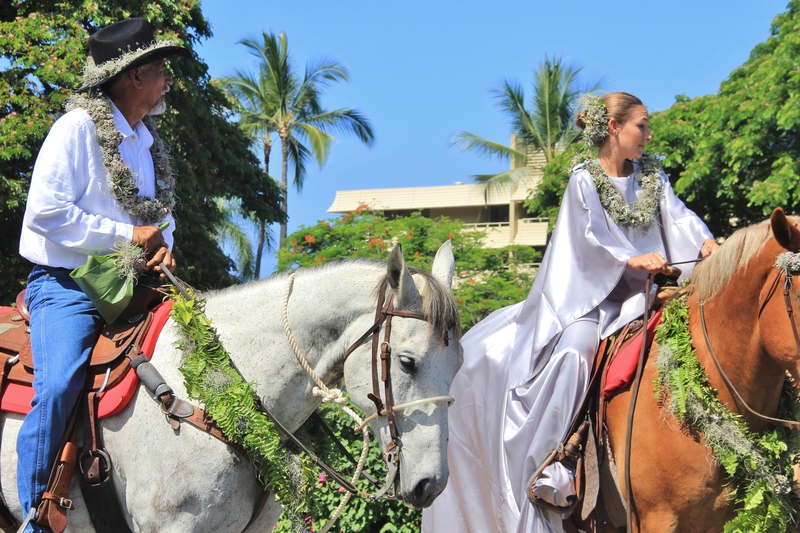 They must be skilled in horsemanship as well as display personality, beauty, elegance and aloha while on horseback. 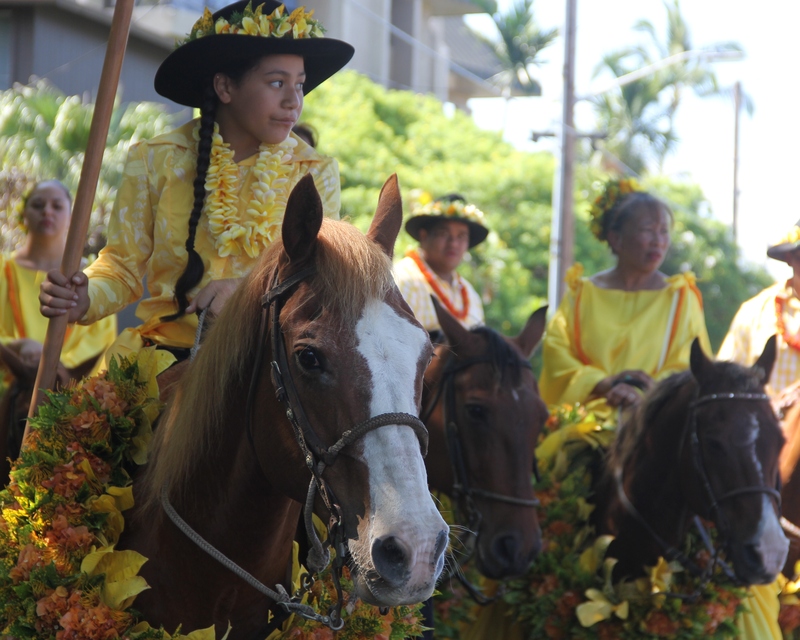 To see the lei-draped pa’u riders smile and wave as they ride by at an easy pace is the epitome of equestrian beauty, honoring the traditional connection with human, horse, land and spirit of aloha. These wahini holo lio (women riding horses) are not mere actors on a stage. The pa’u is much more than a costume for parade. These wonderful pa’u riding women are actively preserving Hawaiian knowledge and heritage, perpetuating paniolo tradition, giving continuity to the customs of their grandmothers and doing so with respect and love for the land, the animals, the flora and the people of Hawai’i. 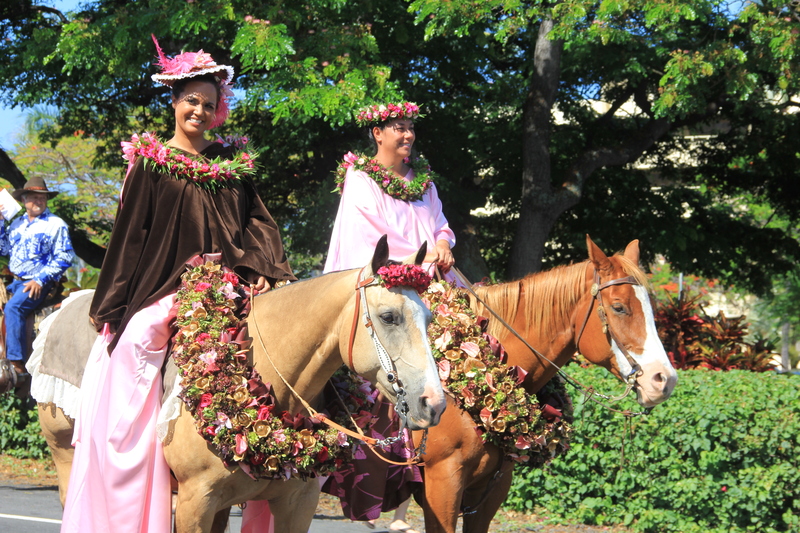 Since the early 1900s, pa‘u riders have brought this uniquely Hawaiian riding style and grace to floral parades across the state. 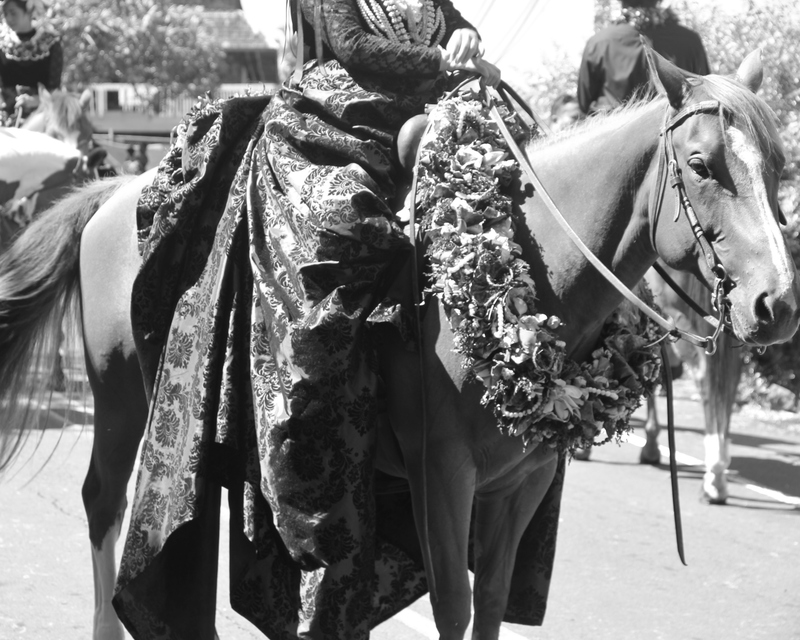 The riders carry on a tradition begun by 19th century women, dressed as queens and riding like warriors. All photographs above are from the June 15, 2013 Kamehameha celebration in Kailua-Kona, Hawaii. Mahalo to the organizing committee for their hard work, dedication and aloha. This entry was posted in Art, history, Nature, the hungry brain and tagged flora, Hawaii, history, photography, Society, sustainable. Bookmark the permalink. I had the honor of riding Pa’u for the island of Maui for the Kamehameha Day Parade in 1980. Our unit came in third. 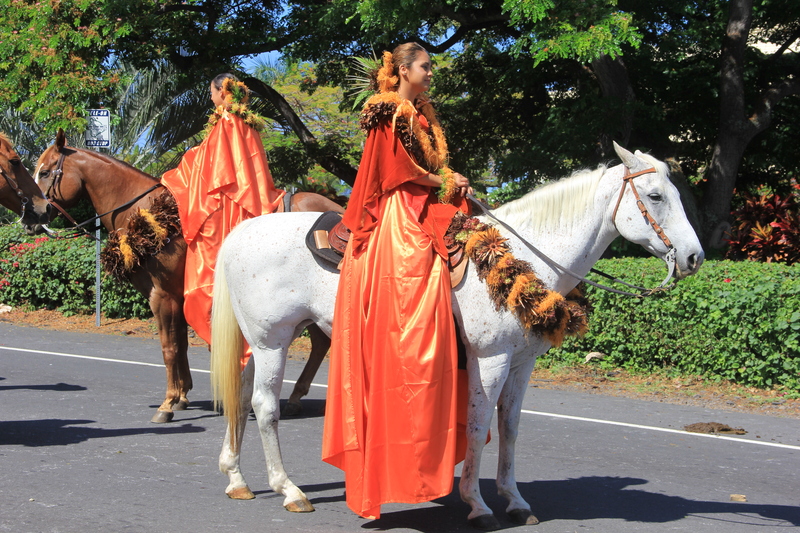 All the people and horses involved made it so wonderful…..
Pa’u riders are one of the most elegant things I’ve ever seen. Beautiful – and yes, it seems unlikely that horses would have been native to the islands, but this is a lovely tradition and some great photos! Just wonderful Dohn.. I had wondered what the story was behind these beautiiful women and exquisite horses in one of your previous posts. Loved it. What a fabulous parade! To see it in person would, no doubt be glorious. BTW, my youngest daughter has been staying with friends on Maui for the past week — while mom and dad swelter in the So Cal heat! That girl is getting to be traveler. I feel for you my son is in L.A. It has been a little hot here on the Big Island also, think it was 90 yesterday. They’re quite beautiful, Dohn. Interesting story. Thank you for sharing this. Thank you Sharon, my pleasure.